Chinese porcelain and tea-drinking were the rage of fashionable Europe when Jean-Étienne Liotard was born. He began painting tea and coffee sets in the last two decades of his life when age, changes in taste, and his political beliefs caused a decline in requests for the pastel portraits that were his specialty. He had, however, been including fruit and porcelain still lifes in some of his portraits since about 1740. Only five of his paintings of tea and coffee sets are known today. 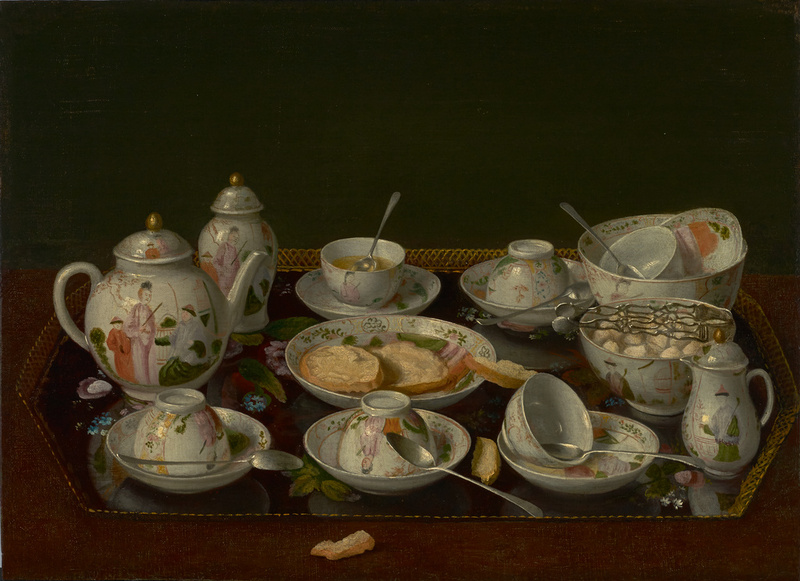 In this painting of tea-time disarray, a tray is set with six cups and saucers, a teapot, sugar bowl, milk jug, and a lidded vase perhaps containing an extra supply of tea leaves. A large bowl holding a teacup and saucer could also be used for dumping the slops of cold tea and used tea leaves. By the time Liotard painted this work in the late 1700s, tea-drinking had become fashionable among the middle as well as the upper classes. Liotard contrasted the luxurious materials of Chinese porcelain and silver with a cheaper tray of painted tin, known as tôle, that imitated Asian lacquer. Combining the transparent, reflective and brightly-patterned objects allowed the artist to portray strong visual contrasts. Fritz B. Gutmann, died 1943 (Huize Bosbeek, Heemstede, The Netherlands), handed over for safekeeping to Paul Graupe & Cie., by 1939. Paul Graupe & Cie. (Paris, France), possibly passed to Art Gallery André Weill, possibly for safekeeping, 1939. Art Gallery André Weill (Paris, France), passed to Cornelius Postma. Cornelius Postma (Paris, France), consigned to Manteau (Cloots) Gallery. Manteau (Cloots) Gallery (Paris, France), sold through Hans W. Lange (Berlin, Germany) to the Führermuseum. Führermuseum (Linz, Austria), restituted by the Allied Forces to the Stichtung Nederlandisch Kunstbezit, 1945. Stichtung Nederlandisch Kunstbezit (The Hague, The Netherlands), restituted to Bernard Goodman and Lili Vera Collas Gutmann. Source: Loche, Renée, and Marcel Roethlisberger. L'opera completa di Liotard (Milan: Rizzoli, 1978), p. 121, no. 351. Dunand Family, by inheritance to Anne Dunand. Anne Dunand (Geneva, Switzerland), sold to the J. Paul Getty Museum, 1984. Source: JPGM, Paintings Department, curatorial files, correspondence with Anne Dunand, 1984. Catalogus der Tentoonstelling 'Het Stilleven' ten bate van de Vereeniging 'Rembrandt' in de zalen van den Kunsthandel J. Goudstikker, exh. cat. (Amsterdam: Den Kunsthandel, 1933), unpaginated, no. 195, fig. 51. Trivas, Numa. "Catalogue raisonné of the works of Jean-Etienne Liotard" (unpublished typescript, 1936), p. 435, no. 312. Meesterwerken uit vier eeuwen 1400-1800: Tentoonstelling van schilderijen en teekeningen uit particuliere verzamelingen in Nederland, exh. cat. (Rotterdam: Museum Boymans, 1938), pp. 48, 126, no. 195, ill.
Ottema, Nanne. Chinese Ceramiek: Handboek geschreven naar aanleiding van der verzamelingen in het Gemeentelijk Museum Het Princessehof te Leeuwarden (Amsterdam: J.H. de Bussy, 1943; rev. ed., Lochem: Tijdstroom, 1970), pp. 115-16, 147, no. 73, ill.
Lunsingh Scheurleer, D. F. Chinese Export Porcelain: Chine de Commande (New York: Pitman, 1974), p. 103. Loche, Renée, and Marcel Roethlisberger. L'opera completa di Liotard (Milan: Rizzoli, 1978), p. 121, no. 351, pl. 61. Fredericksen, Burton B. "Recent Acquisitions of Paintings: The J. Paul Getty Museum." Burlington Magazine 127, no. 985 (April 1985), pp. 266, 268, fig. 103. "Acquisitions/1984." The J. Paul Getty Museum Journal 13 (1985), p. 214, no. 149, ill.
Leonard, Mark. "Notes on the Restoration of Jean-Etienne Liotard's 'Tea Set.'" The J. Paul Getty Museum Journal 13 (1985), pp. 130-31, figs. 1a-b. Lippincott, Louise. "Liotard's 'China Painting.'" The J. Paul Getty Museum Journal 13 (1985), pp. 121-30, figs. 1a-f.
Roethlisberger, Marcel. "Jean-Etienne Liotard as a Painter of Still Lifes." The J. Paul Getty Museum Journal 13 (1985), pp. 119-20, fig. 23. Hiller, Bevis. "Tea at the Getty: Two Museum Paintings Hold Interest for Collectors of Fine China." Los Angeles Times Magazine (April 26, 1987), p. 53, ill.
Roethlisberger, Marcel. "The Unseen Faces of Jean-Etienne Liotard's Drawings." Drawing 11, no. 5 (January-February 1990), p. 98. Gruber, Alain, ed. L'art décoratif en Europe. Vol. 2, Classique et Baroque (Paris: Citadelles & Mazenod, 1992), p. 309, ill.
Montagni, Loredana Pessa. Giacomo Boselli: Cultura e cenio di un ceramista del Settecento (Genoa: Sagep, 1994), pp. 25-26, ill.
Stafford, Barbara Maria. Artful Science: Enlightenment Entertainment and the Eclipse of Visual Education (Cambridge: MIT Press, 1994), pp. 79, 81, ill.
Apgar, Garry. L'Art singulier de Jean Huber: Voir Voltaire (Paris: A. Biro, 1995), p. 167, fig. 95. Jaffé, David. Summary Catalogue of European Paintings in the J. Paul Getty Museum (Los Angeles: J. Paul Getty Museum, 1997), p. 74, ill.
Fayet, Roger. Das Bild des Kaffees: Beobachtungen in Kunst und Alltag (Zurich: Johann Jacobs Museum, 1998), pp. 18-19, fig. 6. Stafford, Barbara Maria. "The Visible Invisible." M.A. diss. (The Open University, 1999), pp. 79, 81, fig. 63. Stafford, Barbara Maria, and Frances Terpak, eds. Devices of Wonder: From the World in a Box to Images on a Screen, exh. cat. (Los Angeles: Getty Research Institute, 2001), pp. 32-33, 374, no. 118, ill. Tea Drinking in the West, exh. cat. (Nagoya: Nagoya/Boston Museum of Fine Arts, 2001), pp. 19-20, fig. 10. Blackwell, Mark, ed. The Secret Life of Things: Animals, Objects, and It-Narratives in Eighteenth-Century England (Lewisburg: Bucknell University Press, 2007), cover ill.
Roethlisberger, Marcel, and Renée Loche. Liotard: Catalogue, sources et correspondance. 2 vols. (Doornspijk: Davaco, 2008), vol. 1, figs. 628 and 631; vol. 2, p. 573-75, no. 435. Trumble, Angus. "Tea and the Conversation Piece." In Steeped in History: The Art of Tea, exh. cat. Beatrice Hohenegger, ed. (Los Angeles: Fowler Museum at UCLA, 2009), pp. 155, 157, fig. B.3. Walker, Corinne. "Le luxe et le pouvoir, ou l'art de la distinction à Genève aux XVIIe et XVIIIe siècles." In Post Tenebras Luxe. Donatella Bernardi, ed. (Geneva: Labor et Fides, 2009), p. 35, ill.
Musée Cognacq-Jay, ed. Thé, Café ou Chocolat? Les boissons exotiques à Paris au XVIIIe siècle, exh. cat. (Paris: Paris-Musées, 2015), pp. 88-89, fig. 44, ill.
Baker, Christopher, et al., eds. Jean-Etienne Liotard, 1702-1789, exh. cat. (Edinburgh: Scottish National Gallery, 2015), pp. 178, 212, no. 79, ill., entry by Mary-Anne Stevens. Stevens, MaryAnne. "Still-Life, Trompe l'oeil and Genre Painting." In Jean-Etienne Liotard, 1702-1789, exh. cat. Christopher Baker, ed. (Edinburgh: Scottish National Gallery, 2015), pp. 164 (detail), 167. Przezdziecka-Kujalowicz, Aleksandra. Wokól herbaty, kawy i czekolady: 200 lat Muzeum Wilanowskiego (Warsaw: Muzeum Palacu Króla Jana III w Wilanowie, 2016), pp. 8-9, ill.
Enke, Roland, Stephan Koja, and Susanne Drexler, eds. "The Most Beautiful Pastel Ever Seen. ": The Chocolate Girl by Jean-Étienne Liotard, exh. cat. (Dresden: Hirmer, with Staatliche Kunstsammlungen Dresden, 2018), p. 166, no. 22, ill., entry by Susanne Drexler. Weber, Julia. "What Struck Algarotti as Chinese in Liotard's 'Chocolate Girl.'" In "The Most Beautiful Pastel Ever Seen. ": The Chocolate Girl by Jean-Étienne Liotard, exh. cat. Roland Enke, Stephan Koja, and Susanne Drexler, eds. (Dresden: Hirmer, with Staatliche Kunstsammlungen Dresden, 2018), pp. 69, 71, fig. 4. Lesson in which students study artwork and vocabulary related to things for meals.